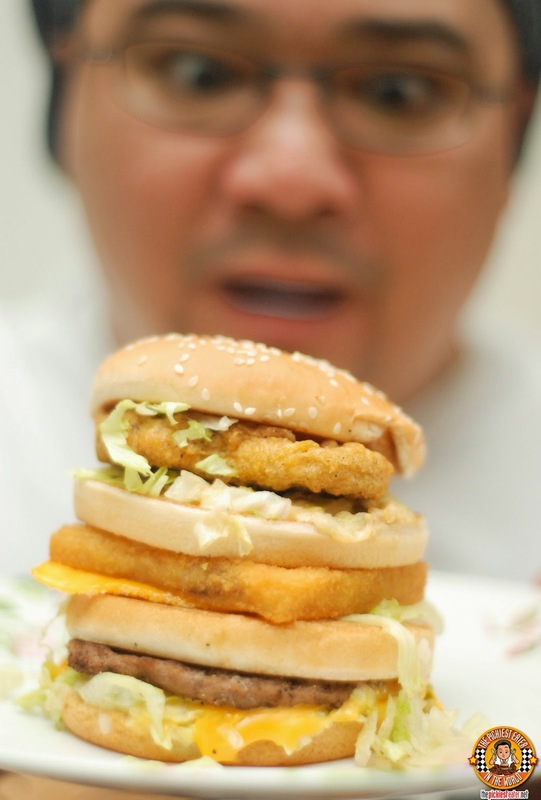 I had heard the rumblings on the web for quite some time now of McDonald's coming up with a burger so epic, it's going to make their Big Mac look like something from "Buena Bonita Burgers". And just how I couldn't wait to share the news of the McRib and the McGriddles coming to the Philippines, I am proud to announce that indeed, the rumors are true. 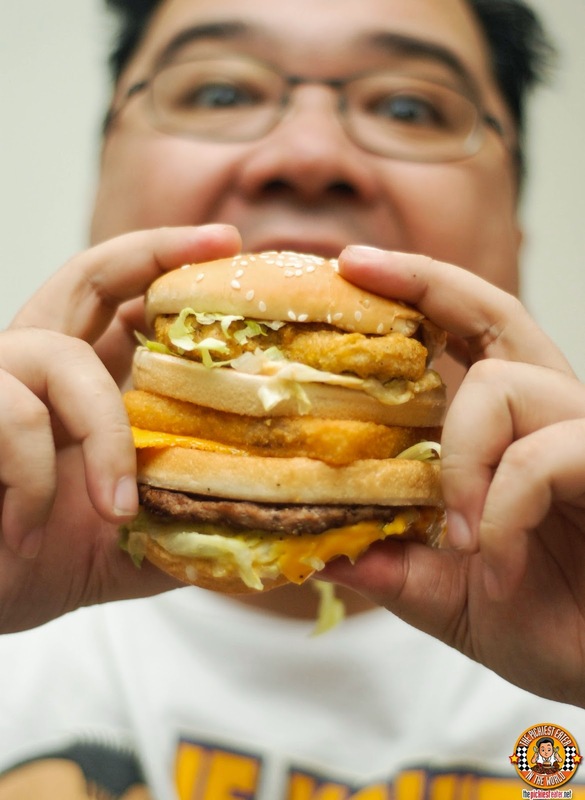 McDonald's has taken three popular burgers in their menu, and creating one ultimate MEGA burger.. 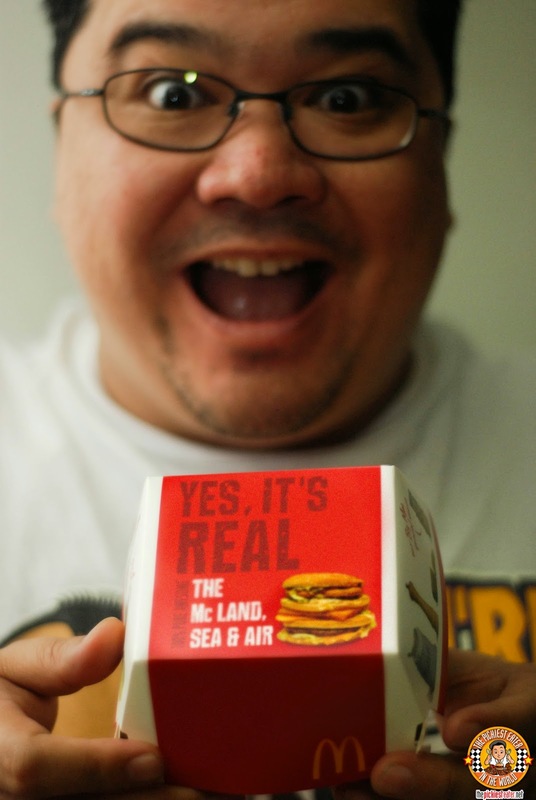 BEHOLD, Mcdonald's newest burger, The Mc Land, Sea and Air is now available in the Philippines!!! My frenzied hunt for this previously considered "Mythical" burger began yesterday, when Rina sent me a text message asking if I had tried "McDonald's new Burger". I initially thought she was talking about the Double Fillet-o-Fish, so I reminded her that it was I had for dinner last Friday. 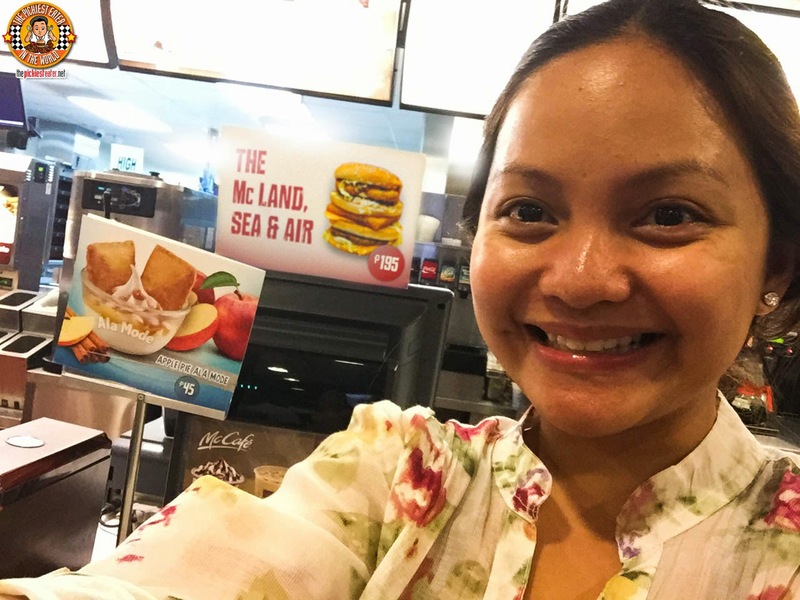 She then sent me this picture of her standing in line at McDonald's (obviously to make me jealous), and said, "No, I'm talking about the Mc Land Sea and Air!". So as you can imagine, I sped off to meet her at the nearest McDonald's. Holding the monolith of a burger in my hand was absolutely surreal. 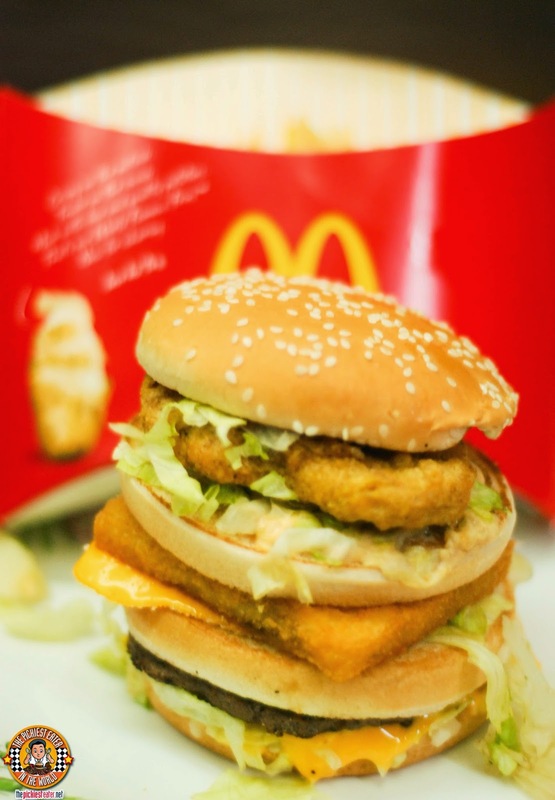 The Mc Land Sea & Air is a triple decker burger that is made with a Big Mac Patty, a Fillet-o-Fish Patty, and a McChicken Patty.. Hence the name "Land, Sea & Air". This is every McDonald's lovers dream come true. Don't know what to order among the three burgers? Screw it, Order them all!! As you can imagine, the burger is incredibly heavy though, so expect this to be your lunch AND dinner, especially if you order it as a value meal with fries (Rina and I got the BFF Combo meal hehe). 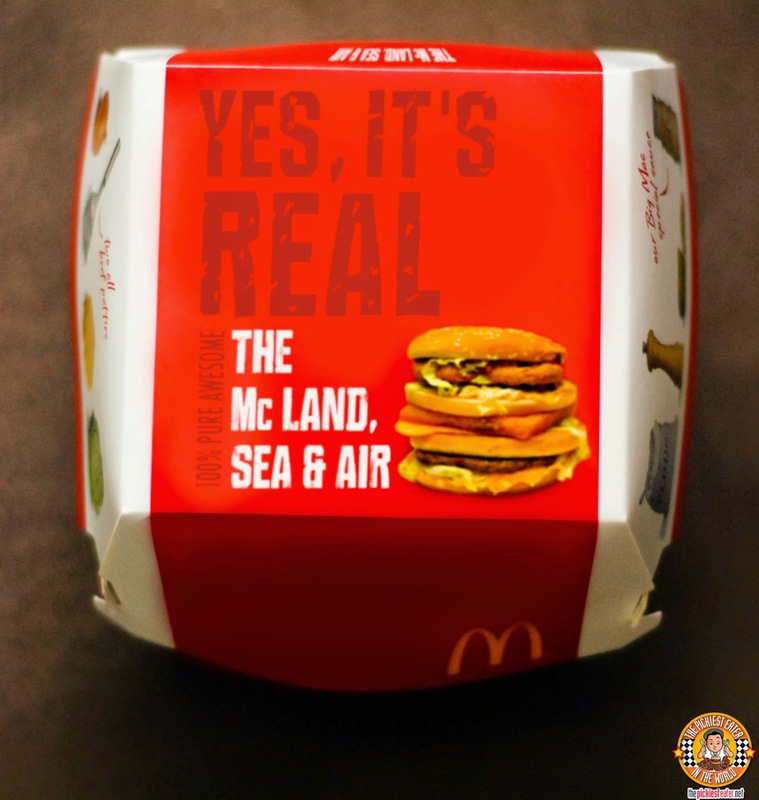 The Mc Land, Sea & Air is available for a limited time only in selected outlets, so I suggest you try it now while you can!! For a list of the selected outlets and Value Meal Prices, click here!! In fairness, masarap talaga siya!! Daig mo pa si Sec. Jun Abaya ng DOTC!!! nyahahahaha! but i would live to try that. 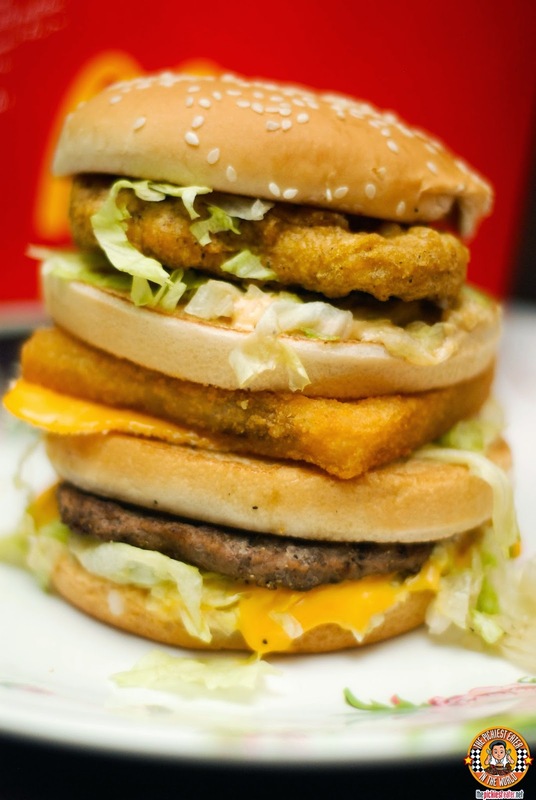 i've had a double filet-o-fish with a hash brown inside it, for breakfast once. Whoa.. Hashbrown filled double Filet o fish sounds brilliant!! Haha mas high in cholesterol ako! Oh wow I love the concept of land, sea, and air! I haven't thought of that. :)) Now you got me curious on how the burger would taste in one large bite! Yummy! Happy April Fools Day! Sir Richie! Who knows baka naman meron talaga. Lol! what is the air? chicken can't fly?